(Newser) – Janet Yellen submitted her resignation from the Federal Reserve board to President Trump on Monday, announcing that she will leave when her successor is sworn in as Fed chairman. In a letter to the president, Yellen said she would do her "utmost" to ensure a smooth transition to Jerome Powell, who was tapped by Trump on Nov. 2 to become the next Fed leader after the president decided not to offer Yellen a second term. Yellen's decision means Trump, in his first year of office, will have had the chance to fill five positions on the Fed's seven-member board, in addition to picking Powell to be the next Fed chairman. Board member Lael Brainard will be the only Fed board member not nominated by Trump, whose selections will have tremendous influence in setting the country's monetary policy. Powell, at one time the only Republican on the Fed board, is not expected to encounter major hurdles in winning confirmation to the chairman's job, the AP reports. 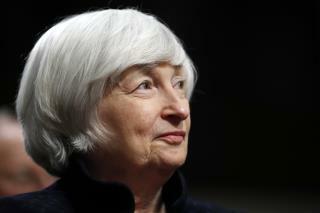 Yellen's four-year term as Fed chair ends on Feb. 3. But she could have chosen to remain on the board until her term as a board member ended in January 2024. At the moment, the board has three vacancies including the No. 2 spot of vice chairman. The president earlier this year tapped Utah financier Randal Quarles to be vice chairman for supervision. She should teach Hillary how to step down graciously. Fiscal Policy is the collective term for the taxing and spending actions of governments. Fiscal Policy aims at stimulating the economy or moderating growth with programs of government spending (up or down), money supply (more or less), lowering taxes or raising them to adjust economic activity for optimum benefit to the Nation and People. You can think of this as the Goldilocks Policy. Not too hot, not too cold, just right. MonetaryPolicy overseen by the nation's central bank, the Federal Reserve (the Fed), ensures the statutory mandate of maximum employment, stable prices, and moderate long-term interest rates by regulating the supply of money .